The latest in the series of Trades Club Question Time forums on Thursday August 20th will debate if there is a ‘youth problem’ in Hebden Bridge. The panel will discuss whether the town has problem youths or just adults who have problems with young people and debate what needs to be done to improve facilities and opportunities for young people who are the future of Hebden Bridge. The Question Time sessions have seen some heated debates and the panel for the youth session includes skater John Gale, Carol Stone who is Head of Calderdale Council’s Young People’s Services and a representative from Hebden Bridge Woodcraft Folk. The weekend continues on Friday August 21st with new club night Nothing to Declare promising an eclectic mix of house and retro tunes from local DJs Zac Greenwood, 2 Cool Tony and Joel Booth Vamos. Singer songwriter Lorelei Loveridge plays her first gig at the club on Saturday August 22nd promoting her new album ‘Bakhoor’ which features deeply personal songs recorded over four years in India, Canada and Saudi Arabia. 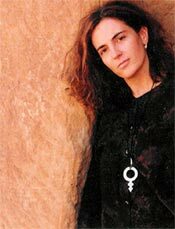 Lorelei spent eleven happy years living in Saudi Arabia pre and post 9/11 so Bakhoor documents her physical, personal and musical journey in the Middle East showcasing her acute political sense in complex personal songs that go way beyond politics. Thomas Mapfumo concert cancelled - the Trades have announced the Thomas Mapfumo concert scheduled for Sunday August 23rd has been cancelled due to visa difficulties. Refunds are available from the club. “Our series of Question Time debates have been very popular provoking some very heated discussions so we’re expecting a forum looking at our so called ‘youth problem’ with a great panel to be very lively,” Trades Club Spokesperson Paul Clarke told the Hebden Bridge Web. “It’s about time young people had a platform at the club to say what they think is missing in Hebden Bridge for young people and to hear their ideas for what could give those who are after all the future of our town something positive to do.